The all-season speed-rated touring tire for superior mileage and more wet traction. The sharp edges of the Full-Depth Sipes bite and grip in the snow throughout the life of the tire. In dry-road cornering these edges interlock to increase cornering power and to combat irregular wear. Flow-Controlling Lateral Grooves remove standing water without pumping it into the circumferential grooves. This increases drainage efficiency and allows greater tread contact area for improved hydroplaning resistance, wet traction and tread life. 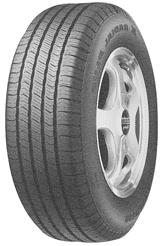 Special tread rubber compound is weather tuned to improve grip in rain and snow without compromising tread life. Longitudinal grooves help drain the footprint efficiently. Their deep, rectangular cross-section promotes superior wet traction throughout the life of the tread. The open shoulder block design stays open to improve wet and snow grip and closes to support one another in hard braking and rapid acceleration. The casing is designed to distribute the load equally throughout the rolling footprint for extended tread life and improved traction.